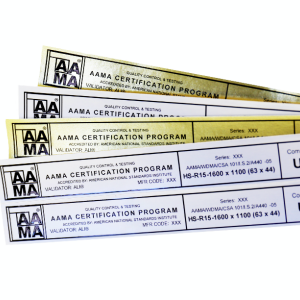 Do you have a Gold "AAMA Certification Program" label, similar to the one pictured here, on your windows? You will need to contact the manufacturer of your windows. To locate the manufacturer, look for the Manufacturer’s Code where it says “MFR CODE” or “CODE.” This code can be found below the word "Program", where is says "AAMA Certification Program." The code will be a sequence of two or three letters, a hyphen and a number (i.e. ; AB-1). Once you identify the Manufacturer’s Code go to the archived certified product directory and enter it in the search box. This directory contains an archived listing of products that are no longer a part of the AAMA program, for any of several possible reasons. Click here to view sample labels. What if my label is silver? NFRC's Certified Products Directory or contact them at 301-589-1776. Manufacturer's Code not listed in the archive certified product directory? If your code does not appear in the archived directory, you can also try searching our current Certified Products Directory.